Yes, thank goodness the smoke wasn’t too bad for these areas. Gorgeous. I recognize Moraine Lake and Lake Louise and the wonderful Fairmont hotel. Both lakes were spectacular in their own way. Fantastic photos, Roslyn! Thanks for sharing your amazing trip. Glad you enjoyed the photos, thank you! My, oh my, what you have captured here is breathtaking. Feels as if I was with you on this trip – it would be fun to hike around this area for a month or so…stunning. Our tour guide was a native of the area and said he had ridden his motorcycle all over. But hiking would have been more my speed (although not so much now!). Wow! 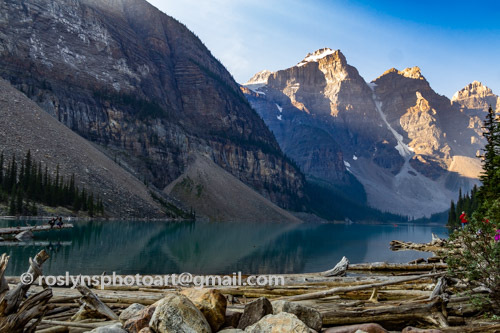 You captured exquisite pictures of these majestic mountains, lakes and rivers. Would definitely like to visit there one day. Thank you for sharing. I hope you do get to visit some day. I ended up going because some friends decided to go… sometimes that’s the best way to make decisions… let someone else decide! Stunning photos of a part of the world I’ve never had the privilege to see. Thank you for sharing them. Well, never say never.. but try not to go during forest fire season like we did! But I digress. Thank you for making my Mom so happy with your pictures! There are times I get so overwhelmed with everything going on in my life I seriously consider giving up my blog. Then I get a comment like yours which makes it all worthwhile! I am old as dirt myself and i understand getting homesick (in my case for England). I’ve visited Vancouver a few times and love that city. Magnificent landscape and your images are stunning. Thank you so much… it’s hard to take a bad picture in such amazing scenery.